Viewing Map: Weather permitting, a night launch of the space shuttle is typically visible from much of the East Coast. The most dramatic view is from inside the yellow circle. But within the red circle, skywatchers may see very bright, pulsating, fast-moving object that resembles the brightest stars in the sky from 3 to 8 minutes after launch. 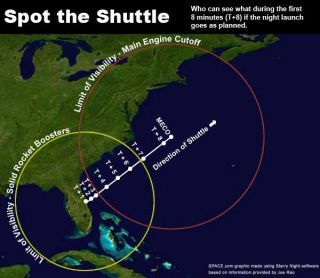 For viewers near the edges of the circles, however, the shuttle will hug the horizon, so an unobstructed view is needed. People in the eastern United States will get a great opportunity,weather permitting, to see the space shuttle Endeavour launched into orbitearly on Sunday morning, Feb. 7. And it will also likely be the very lastopportunity ever to see a space shuttle blast off at night. This flight (STS-130) will be the 32nd to rendezvous and dock withthe International Space Station (ISS). It is the first of NASA?s five finalshuttle missions this year before the fleet is retired in the fall. Out of the 129 previous shuttlelaunches, 29 have occurred in complete darkness. The very first nightlaunch of a space shuttle (Challenger) was STS-8, which took place on Aug. 30,1983. ?There have also been seven Shuttle launches that occurred duringtwilight, four at dawn and three at dusk. ? This upcoming mission was originally scheduled to launch on Feb. 4during morning twilight, but when the launch was rescheduled for Feb. 7, thelaunch time ended up being pushed back into the predawn hours. To reach the space station, Endeavour must be launched whenEarth's rotation carries the launch pad into the plane of the station's orbit. Formission STS-130, that will happen at 4:39:44 a.m. EST on Sunday, Feb. 7,resulting (if all goes as planned) in NASA's final nighttime launch of a spaceshuttle (the most recent was last Aug.28). As has been the case with other launches to the ISS, Sunday'sliftoff will bring the shuttle's path nearly parallel to the U.S. East Coast,and the glow of the shuttle's engines will be visible along much of the EasternSeaboard. A SPACE.commap shows the area of visibility. After this mission, there will be just four more flights leftbefore the shuttle program finally comes to a close (tentatively set forSeptember 2010). Two of these are scheduled to be launched during earlyafternoon, and one during the midday hours. Interestingly, however, STS-134, which will also be Endeavour'sfinal planned flight, is currently scheduled for a Jul. 29 launch just a littleover an hour after sunrise. ?But if weather or technical constraints were todelay that mid-summer launch by about a week, then it too would be launchedprior to sunrise and the first light of dawn, also making it a night launch.Odds are probably long for that scenario to happen however, so this Sunday willlikely be the last nighttime launch of a space shuttle. The brilliant light emitted by the two solid rocket boosters willbe visible for the first 2 minutes and 4 seconds of the launch out to a radiusof some 520 statute miles from the Kennedy Space Center ? an area more thanthree times the size of Texas. Depending on where you are located relative to Cape Canaveral, Endeavourwill become visible anywhere from a few seconds to just over 2 minutes after itleaves Pad 39-A. ?For an example of what all this looks like from Florida, see videoof a night launch made by Rob Haas from Titusville, FL, on Dec. 9, 2006(the STS-116 mission). After the solid rocket boosters are jettisoned, Endeavour will bevisible for most locations by virtue of the light emanating from its three mainengines. It should appear as a very bright, pulsating, fast-moving star,shining with a yellowish-orange glow. Based on previous night missions, thebrightness should be at least equal to magnitude -2; rivaling Sirius, thebrightest star in brilliance. Observers who train binoculars on the shuttleshould be able to see its tiny V-shaped contrail. Observer James E. Byrd shot videoof the shuttle from Virginia after a November 2000 night launch. The brightstar Sirius briefly streaks through the scene giving a sense of scale andbrightness to the shuttle's glow. For most viewers, the shuttle will appear to literally skim thehorizon, so be sure there are no buildings or trees to obstruct your view. Depending upon your distance from the coastline, the shuttle willbe relatively low on the horizon (5 to 15 degrees; your fist on an outstretchedarm covers about 10 degrees of sky). If you're positioned near the edge of aviewing circle, the shuttle will barely come above the horizon and could be obscuredby low clouds or haze. If the weather is clear, the shuttle should be easy to see. Itwill appear to move very fast; much faster than an orbiting satellite due toits near orbital velocity at low altitudes (30-60 mi). It basically travelsacross 90 degrees of azimuth in less than a minute. Endeavour will seem to "flicker," then abruptly wink-outabout 8 minutes and 24 seconds after launch as the main engines shutdown andthe huge, orange, external tank (ET) is jettisoned over the Atlantic at a pointabout 800 statute miles northeast of Cape Canaveral and some 430 statute milessoutheast of New York City. At that moment, Endeavour will have risen to an altitude of about340,000 feet (64.4 statute miles), while moving at roughly 17,500 mph (mach24.6) and should be visible for a radius of about 770 statute miles from thepoint of Main Engine Cut Off (MECO). Following MECO and ET separation, faint bursts of light caused byreaction control system (RCS) burns might be glimpsed along the now-invisibleshuttle trajectory; they are fired to build up the separation distance of theorbiter from the ET and to correct Endeavour's flight attitude and direction. And of course, before hoping to see the shuttle streak across yourlocal sky, make sure it has left the launch pad! Assuming a good load for Endeavour's fuel cell system, the shuttleshould be able to make a number of launch attempts over a 15-day time span,extending to Feb. 22. However, NASA is trying to launch Endeavour ahead of an unmannedAtlas 5 rocket carrying the agency?s new Solar Dynamics Observatory, asun-watching probe slated to blast off on Feb. 9 from the nearby Cape CanaveralAir Force Station. Should the launch be scrubbed, the liftoff time will shift 22 to26 minutes earlier per day. If, for example, the launch is scrubbed on Feb. 7,liftoff on Feb. 8 is scheduled for 4:14:02 a.m. ET; on Feb. 9 it is 3:51:30a.m. ET. Should weather or technical issues delay the launch until Feb. 22,liftoff would then be scheduled for 9:48:13 p.m. ET. During this 13-day mission, both the shuttle and the InternationalSpace Station willbe visible during the predawn hours across North America and Europe. Observers across the northern U.S. and Canada will have visibilitythrough all 13 days, but those living farther south will have views only duringthe first few days and possibly the final day or two of the mission. Unfortunately,across the southern US, no visible passes are predicted to occur.? During the mornings of Feb. 7, 8, 18 and 19 it may be possible tosee Endeavour and the ISS as two separate entities, appearing as bright moving"stars." At all other times during the mission, you'll see only onesingular bright moving star, as that will be when the two space vehicles aredocked together. So what is the viewing schedule for your particular hometown? You can easily find out by visiting one of these four popular Websites: Chris Peat's Heavens Above, Science@NASA's J-Pass, NASA's SkyWatch andSpaceweather.com. Each will ask for your zip code or city, and respond with alist of suggested spotting times. Predictions computed a few days ahead of timeare usually accurate within a few minutes. However, they can change due to theslow decay of the space station's orbit and periodic reboosts to higheraltitudes. Check frequently for updates. Anothergreat site is this one, which provides real-timesatellite tracking and shows you at any given moment during the day or nightover what part of the Earth the ISS or shuttle happens to be.